Hydroxyapatite (HA) porous substrates were fabricated by freeze-tape-casting and used as filter and biomaterials. The influence of the freezing temperature on the pore structures of HA porous substrates was investigated. The permeabilities of the samples with different solid contents and freezing temperatures were also measured. The open porosity of the fabricated HA porous substrate was high, with a closed porosity of only 5–10%, and the lamellar spaces decreased from 2.36 ± 0.53 to 1.11 ± 0.30 μm with the decreasing freezing temperature. 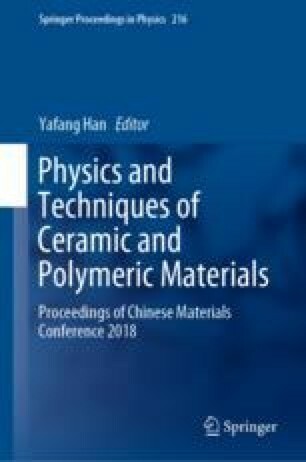 Multilayer HA porous substrates with uniform porosity were obtained by multiple freeze-tape-castings using HA slurry with solid content of 35 wt%. The highest compressive strength of multilayer HA porous substrates was 34.98 MPa when being frozen at −45 °C. The permeability value was 4.1 μL cm−2 min−1. The pore structure and permeability of the porous substrates can be controlled by different physical parameters and freezing conditions. The authors would like to acknowledge the support from the National Natural Science Foundation of China (Nos. 81571014 and 51572217), China Postdoctoral Science special Foundation (2016T90937) and the Natural Science Foundation of Shaanxi Province (2016JQ5058).